The Victoria Inn was built in 1875 as a carriage house for the Leonia Inn of Hampton. 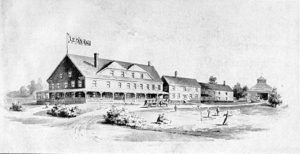 The Leonia Inn was very popular in its day with 24 sleeping apartments, dance, music hall and billiard room. It is said that it was the first hotel to bring “North Beach” to the attention of the public. It enjoyed a large patronage from the U.S. and Europe. It was destroyed by a fire on July 13, 1900 and was never rebuilt. The carriage house, now known as The Victoria Inn, was moved to the front of the property by the owner, George Ashworth, and rebuilt as a guest house. It was a family residence from 1900 until 1988 at which time it was converted to a Bed & Breakfast and has always been known for beautiful weddings and celebrations for all occasions. Through recent ownership the Inn and Garden Pavilion have had complete renovations inside and out. Luxurious guest suites have been completed in 2013. You will find The Victoria Inn elegant, comfortable, and cozy. The Inn offers seven spacious guest rooms and one and two bedroom suites with king or queen-sized beds. Most rooms have private baths All baths have been redesigned and are stocked with Gilchrist & Soames bath products. Updates include tiled floors in all baths, new tubs/showers and jacuzzi tubs in the Hydrangea Suite and Iris Room; all rooms have air-conditioning, wifi, multi-speed Casablanca ceiling fans, cozy central heating, and cable TV with remote. The main floor of the Inn can be rented for any celebration and accommodates up to 60 guests. The Garden Pavilion has been updated, painted and in pristine condition for any celebration up to 150 seated, 200 cocktail style. The grounds are meticulously maintained throughout the year with an assortment of spring, summer and fall flowers blooming. Visible from the Inn’s elegant dining room is the former summer residence of Franklin Pierce (1804-1869), President of the United States from 1853 to 1857. And nearby, along the ocean front, are many other stately homes.